This museum was featured in Southern Living, Delta Magazine and Dolls Magazine. Enjoy a self-guided tour featuring over 1,000 dolls and toys dating back to 1843. At the Biedenharn Coca-Cola Museum, enjoy the wide variety of Coca-Cola memorabilia in an authentic candy store and soda fountain setting. This building is where Coca-Cola was first bottled in 1894. Hop on our deluxe motorcoaches and begin your tour of the South’s Casino Capital! There’s no shortage of fun in this Mississippi town. Tunica offers casinos, history, great food and fun – all within its quaint boarders. The tour starts with a stop at the Tunica River Park. Located on the banks of the Mighty Mississippi, the Tunica River Park is a magnificent combination of modern architecture and nature’s splendor. Step up to the observation deck to enjoy spectacular river views, enjoy the interactive history displays at the Mississippi River Museum, or take a walk through the eco trail, winding through nearly two miles of beautiful wetland forest. Experience the unspoiled timber, native creatures and Mississippi plant life, as you unwind and become one with nature. 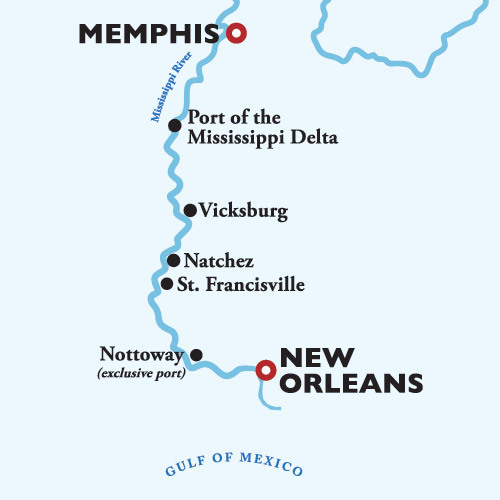 Your tour continues with a stop at the Tunica Museum to delve into America’s diverse history. The exhibits range from Native American prehistory through European exploration, to military and commercial advancements from the 19th and 20th centuries. At the Tunica Casino District, go all in at one of several of the high rollers’ casinos, or enjoy a five-star lunch at a casino restaurant. Thank you for cruising with us! We hope that you had a memorable experience and look forward to welcoming you aboard in the future. Enjoy Memphis at your leisure or consider a Post-Cruise Premium Shore Excursion with airport transfer..